Summary: Opening title is 'A Round Up. Croydon Walk' A B.B. Production. We see a number of workman type cottages possibly near Croydon power station, followed by a white wooded pavilion building with Victorian decoration. A 1960s/70s office building can be seen in fenced off grounds with a number of 1970/80s vehicles parked in the forecourt, one huge gas cylinder can be seen in the background and a large Victorian type building to the right. A dramatic scene of the the two cooling towers of the Croydon power station are demolished by explosion (in 1970 Croydon power station was one of the last to use wooden cooling towers and was decommissioned in 1973). Spectators can be seen in a local park (possibly Wandle Park) watching the events on a grey day with clouds of smoke filling the air. We see children playing in the same park on a sunny day a football field is in the background and we can see a gas cylinder. A garden can be seen in spring time with flowers in bloom. A rear view of a distinctive building with three turrets, followed by a whitewashed square house, possibly on New Road Croydon. housing estate. We see a red brick building joining what appears to be a small chapel, the building has vine growing up the front of the building. Views of the four steeple tower and clock face, and building foundation work location unknown. A view of a row of houses possibly 19th century with black iron railings on the front, a large Tudor style building possibly on church street. We now see the E. Reeves furniture shop built in 1867 in a mock Tudor style on Church Street, Reeves Corner - this building came to considerable public attention during the 2011 riots, when it was completely destroyed by fire. A large grand black and white Tudor building is then seen with Pickfords removal warehouse in the background. Views of Croydon Surrey Street Market on a sunny day,with crowds of people dressed colorfully enjoying looking and buying at a variety of market stalls. A view of the Ship public house with a Henekey Inns Est 1695 sign at the top of the building together with a large stone mermaid white figure on the front. Views of a Tudor stone building with a small archway. A view of Croydon town centre by the traffic lights showing Debenhams and Allders department stores, a small amount of traffic is seen with people crossing at the traffic lights, including two women who wear large flared trousers. 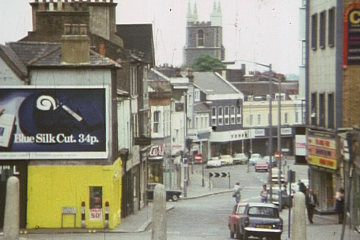 Croydon Minster church tower is seen through a side street with cars parked on the left had side, an advertising hoarding displays Blue Silk Cut for 34p, a few people in 1970's dress walk up and down the road. An Indian temple style building is viewed with a dome like turret,followed by a different building featuring an ornamental style pot, a signpost for Dean & Co (Croydon) Builders merchants is seen in the background. Rooftops of Victorian style factory buildings with a view of the front of a brick building with a white fence a sign can be seen for WW Lillico & Sons Ltd.(A corn chandler and seeds business which still exists today) possibly in Landsdowne Road. A stone water trough inscribed with Metropolitan Drinking Fountain Cattle trough association is seen by a small green with cars in the background. A large public house in Edwardian style named the Leslie Arms (Inn Coope) on the Lower Addiscombe Road, followed by a view of a school type building on the corner of a road. A see a faded white stone sign stating Croydon General Hospital, supported by, outpatients Department founded in 1867. We switch to a marque in a garden or park with 1960's tower blocks in the background, people are walking around dressed in a mix of casual wear and men in suits. A number of nurses in uniform are outside the Garden Hall, possibly in the grounds of the hospital, with elderly members of the public, some are sitting and others wander around very relaxed and chatting to each other. People are getting food from the marque and stand around eating and talking to each other. A high street scene with the Rising Sun next to the Ye Boot Shoppe on the London with an Asian couple walking past, more shops are seen including Hurlock's which appears unoccupied, H Bowley,and Hollidge Bros (footwear specialists). A large Victorian building possibly a school is seen, with a view of a faded factory wall showing a painted sign for 'Paterson & Co Carriers. A view of Church Lane in Broad Green is seen, then we move to a view of the Princess Royal public house, an Edwardian style building with tiles at the bottom of the building. Cut to another shot of the steeple of Christ Church on Summer Road, followed by a close up of the church sign. We then see another Victorian building, followed by a man in a blue shirt looking out the door of his house. Next is an exterior shot of a row of terraced house on Congley Road; an elderly man steps outside accompanied by a white poodle. A woman in a blue overall-type dress looks out her front door. The next scene is a fancy-dress party - one woman seems to be wrapped in masking tape, while other women wear silly hats. They dance and drink, in some sort of large hall. Next, we see small sail boats on a lake, one of which wobbles precariously. Pigeons peck the ground at the edge of the lake, while ones pursues the others. Ducks sit nearby and swim. Next we see a large park with flowers, followed by a shot of Croydon Clocktower, then the Ashcroft Theatre and Fairfield Halls. Tabemer House, a huge tower block built between 1964 and 1967, gleams in the sunlight as a helicopter flies past in the distance. Park Hill Water Tower, a mock-medieval style building, rises up above the trees in Park Hill Recreation Ground, wrapped in ivy. The trees in the park are in full bloom as a squirrel searches for food in the grass. After a shot of bright orange flowers, a closing title reads THE END. Description: Opening title is 'A Round Up. Croydon Walk' A B.B. Production. We see a number of workman type cottages possibly near Croydon power station, followed by a white wooded pavilion building with Victorian decoration. A 1960s/70s office building can be seen in fenced off grounds with a number of 1970/80s vehicles parked in the forecourt, one huge gas cylinder can be seen in the background and a large Victorian type building to the right.